“I have a surprise for you,” said Julio, our brown-skinned guide at Hotel Titilaka in the Highlands region of Peru. The motor boat we were riding in was approaching Uros, a community of more than 70 floating islands, on Lake Titicaca. The boat docked beside one of these tiny islands made from totora reeds. When we disembarked Julio cautioned us to walk carefully on the crunchy, undulating strands. 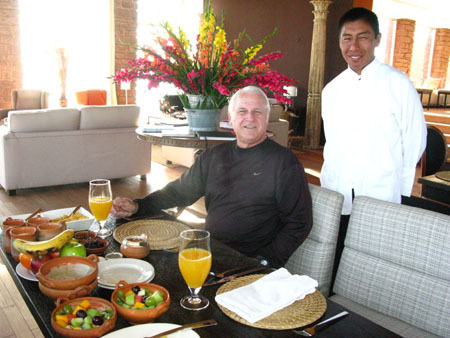 Julio’s passion for his ancestry helped us understand why the upscale Hotel Titilaka, situated in a remote rural area overlooking the world’s highest navigable lake (12,500 feet altitude), considers sharing experiences as important as pampering guests. 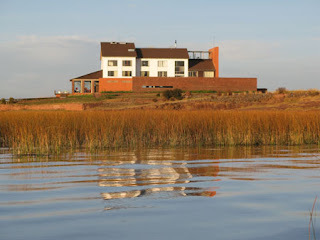 When Peruvian developer Ignacio Masias purchased an existing hotel on a private peninsula jutting into Lake Titicaca, he decided to enlarge the rooms, add walls of windows to take advantage of spectacular scenery, and provide included excursions, airport transfers, meals, and drinks--altogether marketed as The Andean Experience. The renovated hotel, opened in May 2008, has seen remarkable success catering to families, adventure-seekers, and couples looking for a secluded, romantic destination. Native people make up most of the staff. Once guests arrive at this tranquil oasis, they are catered to by gracious staff, about half of whom were hired from local communities. 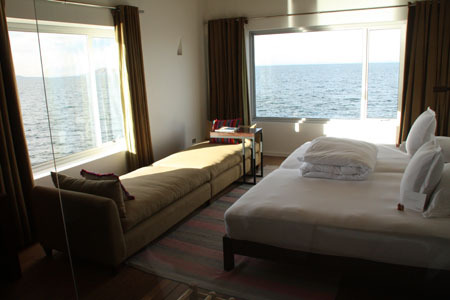 Eighteen large, contemporary rooms feature earthy colors that connect guests with the natural environment of Lake Titicaca. Indulgences include heated floors, spa bathrooms with oversized tubs and massage showers, indoor chaises with gorgeous lake views (perfect for napping), comfortable king-sized beds, spacious double vanities, and complimentary stocked minibar. In addition to views of stunning mountain and lake scenery, it was the opportunity to learn about cultures built on ancient traditions that brought us to Peru’s high plateau. 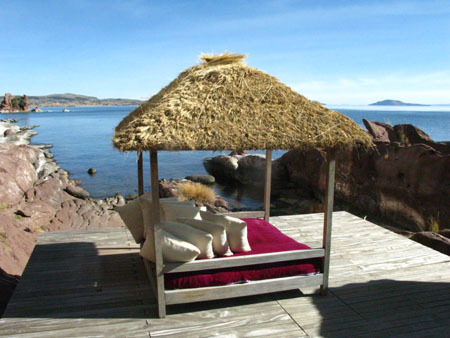 Lake Titicaca is more than just a large body of water: It combines history (considered the birthplace of the Inca civilization), nature (birdwatcher’s paradise), geography (terraced farmlands running to the base of the mountains), and mountainous topography (key component of the Andes). 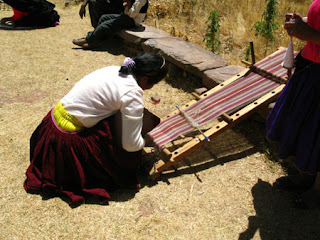 The day before our excursion to Uros we had spent the morning on Taquile Island visiting with indigenous Quechua people who live a traditional farming lifestyle, completely detached from the rest of the world. Excursions such as these revolve around local culture and allow the hotel to promote economic development of nearby communities. Sure, guests savor breathtaking scenery and impeccable service at this intimate resort, but more important is observing living history and appreciating natural resources of the region. Blending the two is a mission that Hotel Titilaka does well.